Zierscheiben, the left one dated to ca. AD 400. 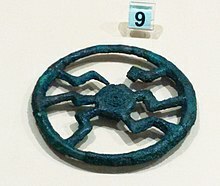 Zierscheibe (German for "ornamental disk") in archaeology is the term for a kind of metal jewellery dating to the European Iron Age. They are found in women's graves and are thought to have been worn as pendants attached to the tunica, or as part of a belt pouch. Early examples date to the Late Bronze Age (ca. 800 BC). They develop into characteristic designs notably attested from Alamannic graves from the migration period. This article relating to archaeology in Europe is a stub. You can help Wikipedia by expanding it. This page was last edited on 15 March 2019, at 08:58 (UTC).